Decks, patios, and porches – they all extend your home’s living space and allow your family and friends to connect with the great outdoors. But it can get hot out there! Exterior shades and awnings are a great way to keep everyone comfortably protected from the sun and heat. They’re the perfect architectural addition to your home, opening up vistas while protecting valuable furnishings from the sun’s rays. An added bonus: they can play a big role in conserving your home’s energy use. Below, we’ve expanded on some of the shades that benefit most from exterior shades, retractable awnings, or ZipRite shades. There are many areas of your home where you probably enjoy – and prefer – natural sunlight. Kitchens, offices, and reading areas all benefit from daylight. In many homes, though, there are long periods of daylight hours when no one is at home, making direct sun unnecessary. That’s the time exterior protection, such as our exterior retractable shades can help with energy efficiency, dramatically cutting air conditioning costs in the hot summer months; or for desert areas like Las Vegas, most months of the year. Do you love entertaining poolside? Retractable awnings provide instant shade, offer sun protection and add value to your home. What’s more, they expand your living space outward, creating a beautifully-shaded outdoor oasis where friends and family can gather. Retractable awnings are easily installed to any part of your home and they come in a wide range of colors, styles, and fabrics to perfectly complement your home’s exterior. Family and friends no longer have to worry about shading their eyes from the sun while enjoying your backyard. Retractable awnings are versatile and add a lovely splash of color to your home’s exterior façade. They’re great for protecting outdoor furnishings from the sun’s harsh rays and, unlike fixed awnings, they can be open and closed as need, such as when plants and flowers require sun or the space needs direct sunlight to warm up. If you live on a golf course, choose a ZipRite Shade. A revolutionary shade design that eliminates all gaps between the fabric and track, it provides a complete seal that protects your home from errant golf balls. It’s also great for keeping out wildlife and pests and allows you to create an expanded living space entirely secured for pets. Protect your family and pets alike. 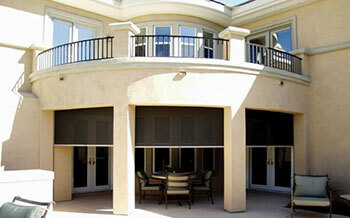 At Polar Shades, we understand first-hand how important it is to have comfort within your home’s outdoor space. We offer an expansive range of beautiful exterior shades and awnings in a wide variety of colors sure to complement any home. All of our products can be custom made to your home’s unique specifications and sun control needs and are powered by industry-leading Somfy motorized controls. Start enjoying the space outside your home in ways you never imagined by contacting us today at 877-260-6110 or request an in-home estimate.